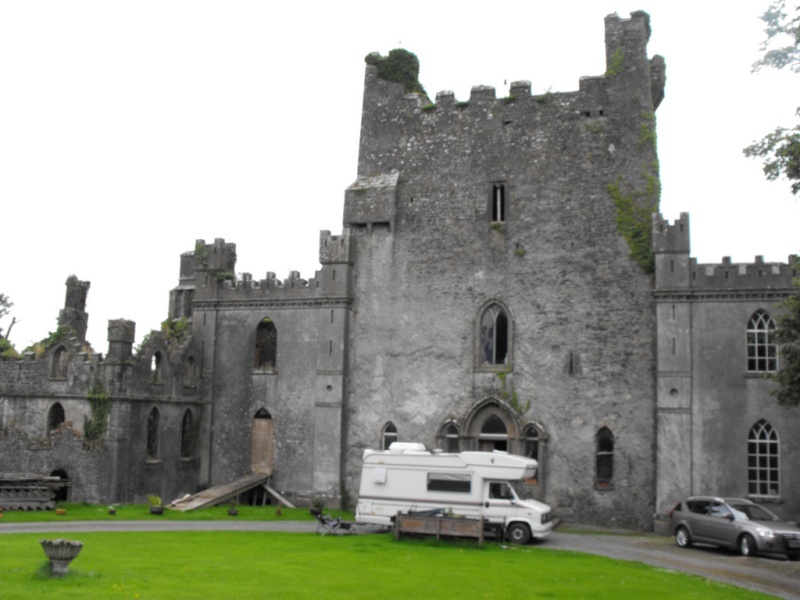 Leap Castle was built in 800 AD by the O'Bannon family and was originally called "Leim ui Bhanain," or "Leap of the O'Bannons." The O'Bannons were the "secondary chieftains" of the territory, and were subject to the ruling O'Carroll clan. Once the principal seat of the powerful and warlike O'Carrolls who were the Princes of Ely, the imposing Leap Castle stands on an ancient rock near the town of Birr in County Offaly, guarding a strategic pass through the Slieve Bloom mountain range. 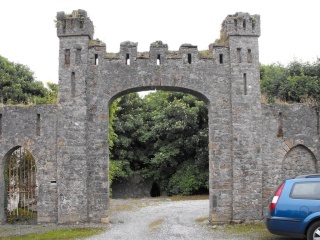 This Castle has long been regarded by many to be the most haunted castle in Ireland and this is not surprising considering its bloody history particularly during the occupation of the O'Carroll family. In the 16th century, feuding and bloodshed between warring clans was quite a common occurrence and there are many stories of guests been invited to dinner at the castle and then being massacred before they could devour their desert. Above the hall of the great fourteenth-century tower is what is known as the 'Bloody Chapel' and it is here where it is said that 'one-eyed' Teige O'Carroll murdered his brother at the altar. 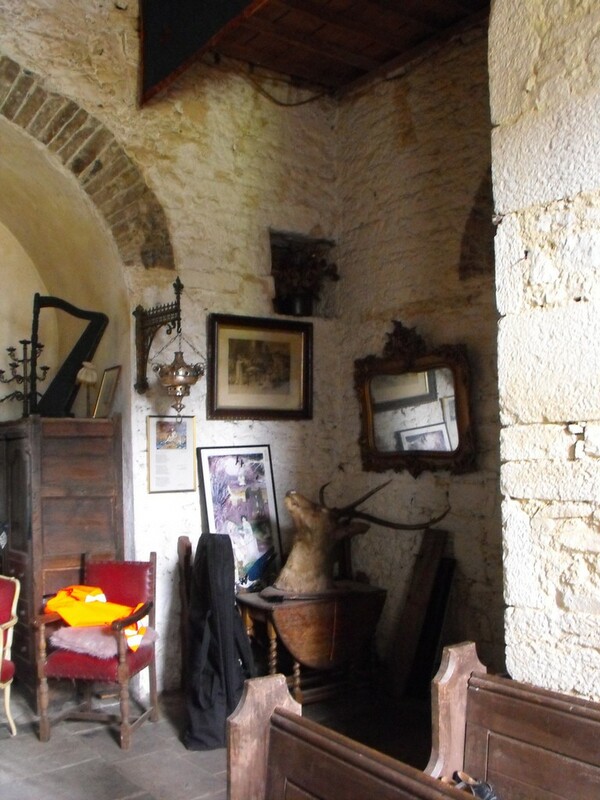 In one corner of this room may be found a secret dungeon (oubliette) into which unwary prisoners were dropped through a trap door and left to rot if they hadn't already been skewered on the spike protruding from the floor. Apparently, there were several cartloads of bones removed from here after the house was destroyed by fire in 1922. There is supposedly a network of dungeons carved out of the rock below the keep with secret chambers and bricked up areas and human remains have also been discovered there. 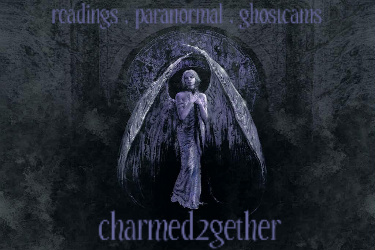 Many visitors to this site have spoken of feelings of real terror and a sense of evil in some places and others have related encounters with a ghostly Lady in a red gown. The most terrifying of all reports is that of a small hunched creature which has appeared from time to time accompanied by the stench of a rotting corpse and the smell of sulphur. The creature is referred to as the "It" or the "Elemental". 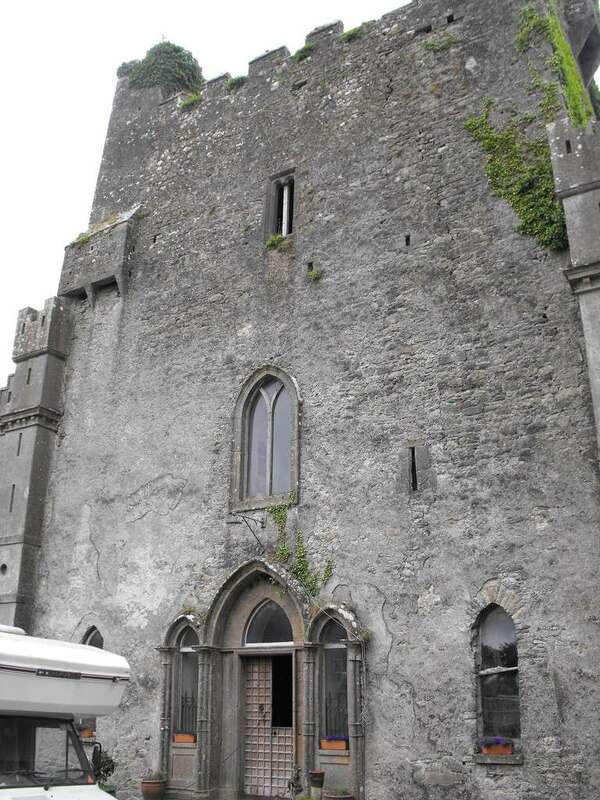 In 1659 AD ownership of Leap Castle passed through marriage from the O'Carroll family to the Darbys, an English family. At that time, the occult was the fashion of the day, and Mildred Darby did some innocent dabbling, despite the castle's history and reputation for being haunted. Mildred's dabbling with magic is thought to have been what might have awakened 'elemental'! In 1909, Mildred wrote an article for the Journal Occult Review, in which she described her petrifying ordeal. "I was standing in the Gallery looking down at the main floor, when I felt somebody put a hand on my shoulder. The thing was about the size of a sheep. Thin gaunting shadowy..., it's face was human, to be more accurate inhuman. Its lust in its eyes which seemed half decomposed in black cavities stared into mine. The horrible smell one hundred times intensified came up into my face, giving me a deadly nausea. It was the smell of a decomposing corpse." Today, the castle is owned by Sean and Anne Ryan who acquired it in 1991 and they soon set about converting it into a family home. However, progression of the work was soon brought to an abrupt end when a ladder that Sean was working on seemed to mysteriously move away from the wall causing him to fall with a fractured knee. Later, Sean broke an ankle in another strange accident and the couple began to feel a little unwelcome! Today however Sean and Anne appear to live in a kind of harmony with the ghosts of Leap Castle. Apparently, a few years ago they found the ghost of an old man sitting by an old fireplace in a chair. It is reported that the couple just said a polite "Good Day" to the spectral gentleman and carried on about their business. All image credit goes to: http://www.thestandingstone.ie a very interesting site, if you get a chance please check it out! Very creepy place! I get the willies just looking at the pics. This was on TV and even creepier seeing the whole thing. Can't imagine the horror that was there. Could you imagine a cam in there. Would love to see that one!